The village of Vassiliki is located around the natural bay of Vassiliki, close to a large green plain, and is the second largest tourist resort on the island, after Nidri. The crystalline waters, the clean beaches of the bay and the lush vegetation of its surroundings attract hundreds of tourists every year, but Vassiliki is a must visit place for surfers from around the world. The currents of the sea in the area of Vassiliki make it a number one destination for windsurfing, while the 'Royal Club' hands on lessons. Even though the wide bay is quite sheltered, the wind blowing in the afternoons, called “Eric” creates the perfect conditions for such a water sport. Together with a few other spots on Greek islands like Ixia in Rodos, Golden Beach near Piso Leivadi in Paros and Kamari in Santorini is supposed to have the best waters for this kind of sports in the Mediterranean. The beaches in this area, as most beaches on Lefkada, are shingly. The main beach of the village is well-organised, with sun loungers, umbrellas and other facilities. The village of Vassiliki is situated on the eastern side of the bay, whereas on the western side is the small resort of Pondi. From there you can enjoy the breathtaking view of the whole bay of Vassiliki or alternatively you can go sightseeing and visit the old churches, the natural springs and the traditional windmills. If you are staying in Vassiliki, going to Pondi is only a few minutes walk. Vassiliki is the perfect place to stay as there is a large number of accommodation options, including camp sites as well. On the other hand, if you prefer to stay in Pondi, there are many hotels on this side of the bay too. 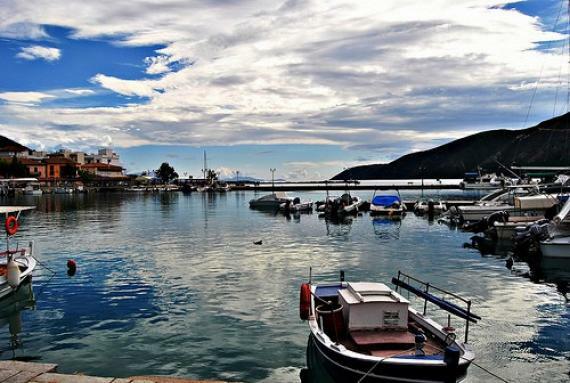 In Vassiliki there is an adequate number of local shops and restaurants on its picturesque fishing harbour. When staying in Vassiliki, you should definitely order some seafood for dinner or lunch in one of the really nice seafood restaurants in the area. In the early evening head to the café patios to enjoy an ice-cold frappe. At night, you will find several bars to have a cocktail or two. Another reason why it is worth staying here is that you can also book a tour around the island or even visit nearby beaches which are only accessible by boat. We suggest that you take the boat from Vassiliki to go for a swim in Porto Katsiki or Agiofili. For those of you who don’t like the laid-back kind of holidays, we recommend that you go for long walks in the beautiful plain or for cycling till the abandoned village of Roupakias. It is a picturesque village with a stream crossing it. Vassiliki is a surfer’s paradise, but even if you are on family holidays or you are seeking some extra fun in the nature, there are still plenty to do! Find information about selected Hotels, apartments and rooms in Vassiliki to choose the perfect place for your accommodation.